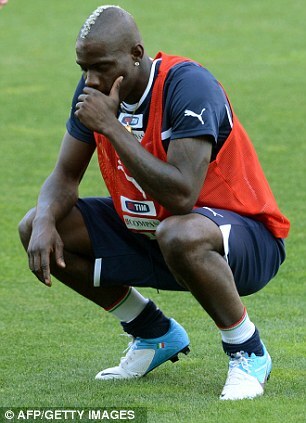 Mario Balotelli has threatened to walk off the pitch if he is racially abused at Euro 2012 and said he would ‘kill’ anyone who dares to throw a banana at him. Manchester City’s volatile Italian striker spoke out amid increasing concerns that black players will be targeted by racists when the tournament kicks off in Poland and Ukraine next week. Balotelli has been the victim of racist abuse on several occasions – most recently in February when Porto were fined over the behaviour of their supporters in a Europa League tie against City. 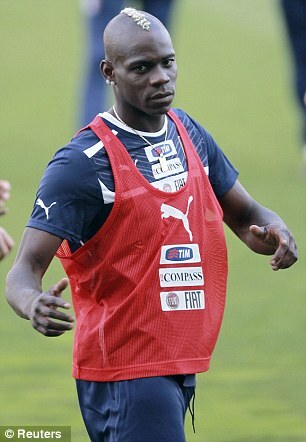 Balotelli, 21, was targeted by Juventus and Roma fans while playing for Inter Milan in 2009, which resulted in Juve having to play a match behind closed doors. In June of that year, he was racially abused and pelted with bananas in a Rome bar while out with Italy teammates in the build-up to the European Under-21 Championships. In an interview with France Football, the striker insists he is a misunderstood ‘genius’ and said he hopes to stay at City despite a series of controversies. ‘It’s not easy when ”call girls” talk in the newspapers or when people say they have seen me here or there during the evening,’ he said. ‘But I would like to stay at City, because here I have affection. Will I stay? I don’t know. I think so. You have to ask Mino (Raiola, his agent). 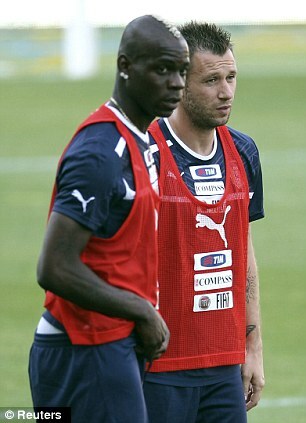 ‘It’s good luck that Roberto Mancini appreciates and understands me. Mancini always gives me confidence. Those who know me, love me. Those who don’t know me, love me, too, or they hate me. Ukraine said a BBC Panorama documentary was ‘xenophobic’ after it showed their fans giving Nazi salutes and taunting black players with monkey noises. Euro 2012: Stadiums of Hate, broadcast on Monday, also showed Asian students being attacked in Kharkiv, a Euro 2012 venue.